“Firefox requires a manual update” scam is the PUP that uses misleading techniques to prevent removal. Use Reimage to locate malicious components and get rid of them faster than with uninstall instructions. A full system scan blocks virus reappearance and prevents traffic to malicious domains. 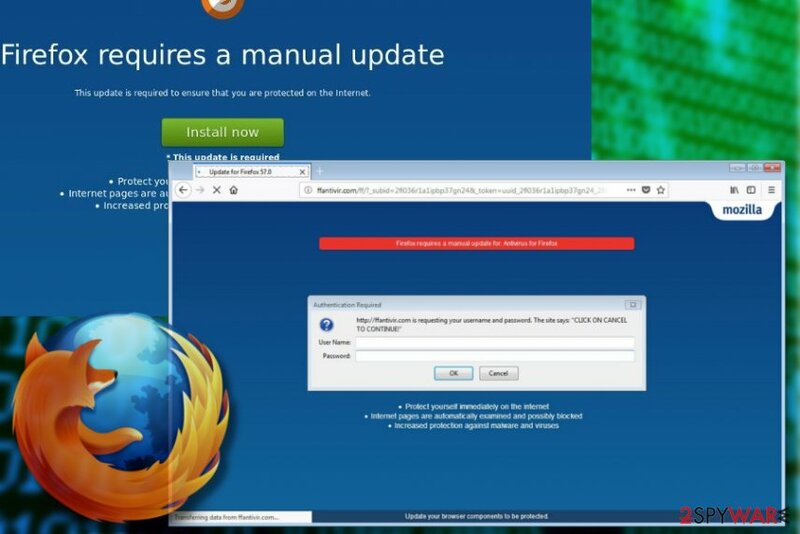 Mozilla Firefox recently reported a fake update notification “Firefox requires a manual update.” Adware and programs usually cause this pop-ups, but quite frequently it may be triggered by third-party websites infected with malicious code. The purpose of the “Firefox requires a manual update” virus is to trick people into installing potentially unwanted Firefox's extensions. Consequently, if the PC's owner clicks on Install Now button, soon he or she will notice a significant web browser's slowdown and increased number of pop-up and banner ads. That's a kind of vicious circle, which can fall less experienced computer users into thinking that Firefox is broken and needs a manual update. However, following on-screen instructions that this fake update prompt provides will lead to the installation of adware, browser hijacker or what not. Thus, to protect your PC from further infections, remove “Firefox requires a manual update” scam immediately. The easiest way to do that is to scan PC with Reimage and then reset Firefox to default. Free programs usually carry potentially unwanted programs as additional installers. Browser add-ons, toolbars, and extensions are usually added under Quick or Basic installation setup as default components, which is why by agreeing with the quickest installation method usually ends up with the infection of adware or browser hijacker. To prevent unwanted programs from being executed on the system, cyber security experts urge people to opt for Advanced or Custom installation method and carefully check all the steps. Besides, people should have a professional anti-malware installed and update it regularly. Powerful security software usually recognizes PUPs and warns people about the unwanted installer. “Firefox requires a manual update” adware can be eliminated from the system with the help of professional anti-virus. Our recommendation is Reimage. This application will remove all PUPs that might have entered your PC by bundling, except that it won't change affected web browser's settings. Therefore, to remove “Firefox requires a manual update” virus entirely, you'll have to reset Mozilla Firefox manually. The guide below this article will help you to do that. If you are not willing to install additional software, you can initiate “Firefox requires a manual update” removal yourself. Our team members have submitted a comprehensive removal tutorial that you can find below. Here, look for “Firefox requires a manual update” scam or any other recently installed suspicious programs. Wait until you see Applications folder and look for “Firefox requires a manual update” scam or any other suspicious programs on it. Now right click on every of such entries and select Move to Trash. When in the new window, check Delete personal settings and select Reset again to complete “Firefox requires a manual update” scam removal. Once these steps are finished, “Firefox requires a manual update” scam should be removed from your Microsoft Edge browser. ”Firefox requires a manual update” virus affects Mozilla Firefox web browser exceptionally. Thus, to stop the rogue pop-up from emerging, reset its default settings. Here, select “Firefox requires a manual update” scam and other questionable plugins. Click Remove to delete these entries. Now you will see Reset Firefox to its default state message with Reset Firefox button. Click this button for several times and complete “Firefox requires a manual update” scam removal. Here, select “Firefox requires a manual update” scam and other malicious plugins and select trash icon to delete these entries. Click Reset to confirm this action and complete “Firefox requires a manual update” scam removal. Here, select Extensions and look for “Firefox requires a manual update” scam or other suspicious entries. Click on the Uninstall button to get rid each of them. Now you will see a detailed dialog window filled with reset options. All of those options are usually checked, but you can specify which of them you want to reset. Click the Reset button to complete “Firefox requires a manual update” scam removal process. ^ Olivia Morelli. Adware – a suspicious group of programs that floods web browsers with ads. 2-Spyware. The highest-quality information about malware and general security. ^ Prachi Bhardwaj. Mozilla Firefox is testing updates that customers fear pivot from its focus on consumer privacy. Business Insider. News coverage site. This entry was posted on 2018-02-06 at 02:17 and is filed under Adware, Viruses. You can quickly scan the QR code with your mobile device and have “Firefox requires a manual update” scam manual removal instructions right in your pocket. How did you remove “Firefox requires a manual update” scam?